The RB-SL2 Twin Mono or Stereo, Limiter. The RB-SL2 is a stereo, or twin independent mono, VCA limiter for use in news-rooms and other locations where the correct level into recording equipment is required, but not necessarily under the control of an engineer, for example, for overload protection. It can also be used as an inexpensive main output limiter for small scale radio stations, hospital radio and student radio. The XLR-3 electronically balanced inputs and outputs can be wired unbalanced to accept an output from domestic equipment. For each channel there is an input gain and a threshold level control. With the limit threshold set to maximum, the input through to output can be normalised using the input potentiometers. Once the unit is acting as a buffer with gain/attenuation, the limit threshold level can be set, with the recovery adjusted for the application. The power LED indicates limiting by flashing. The rear panel mode switch changes the unit from dual mono to stereo, when only the pre-sets for channel 1 (left) are active and apply to both channels. 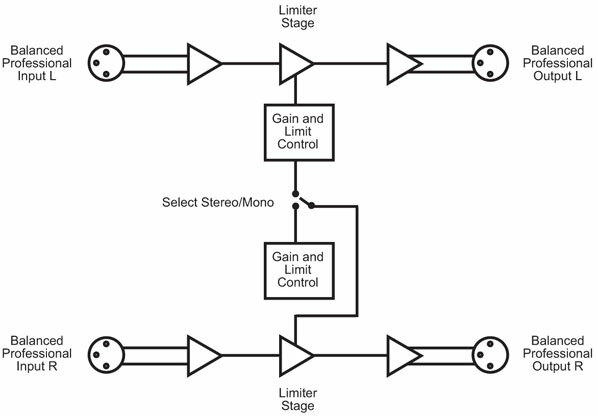 Stereo limiting operates by limiting both left and right outputs if either left or right input needs to be limited. Dual mono limiting operates by limiting left and right signals individually, so you can use the RB-SL2 as two separate mono limiters.